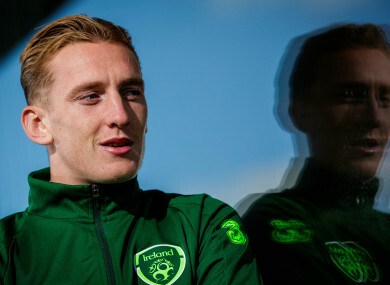 Ronan Curtis has previously been a regular for the Ireland U21 side. MARTIN O’NEILL HAS praised Ronan Curtis, after the 22-year-old attacker made the national senior squad for upcoming matches with Northern Ireland and Denmark. Curtis previously was promoted from the U21 squad for the friendly with Poland back in September, though he was absent from the final squad for the games against Wales and Denmark last month. However, injuries to Shane Long and Jon Walters have helped pave the way for the youngster’s return, with O’Neill showing the faith he has in the player by including him in Monday’s 29-man panel. It represents a reward for the 22-year-old, who has performed impressively at club level since moving from Derry City to Portsmouth in the summer. Pompey are currently top of League One after 17 games, with Curtis having scored six goals in 15 appearances for his new team. “He’s a really genuine lad,” O’Neill said. “He’s got loads of enthusiasm. I saw him play against Peterborough at club level a couple of months ago and he was excellent. I think he’s got in there on merit. O’Neill will be hoping Curtis can help solve his side’s well-documented attacking woes, with blanks drawn in recent Nations League clashes with Denmark and Wales the latest evidence that they lack the necessary cutting edge in attack. However, O’Neill cited the recent good form of Preston duo Sean Maguire and Callum Robinson — who has found the net eight times in all competitions for his club this season — as reasons to be optimistic on the goalscoring front. And in addition to Curtis, another promising young talent has emerged onto the scene. Lee O’Connor, who has captained Ireland at underage level at recent times, has been invited to train with the squad. While the 18-year-old Manchester United youngster is not yet ready for competitive action, O’Neill has been impressed in the brief glimpses he has seen of the player. I think young Lee O’Connor has made a good impression. I’ve been in contact with [Ireland underage coach] Tom Mohan. Tom is very strong on him, which is great. I know we have this idea that we can bring important players in, train with the first team, so when their opportunity comes, hopefully sooner rather than later, but certainly in the foreseeable future, that the surroundings are not strange for them, that they know some of the senior players and that they’re ready to go immediately. Email “O'Neill praises in-form Irish attacker after superb start to life in League One”. Feedback on “O'Neill praises in-form Irish attacker after superb start to life in League One”.